For many Australian families the arrow of intergenerational help is pointing in a new direction. Not so long ago, it was the norm for adult children to lend a financial helping hand to their ageing parents. 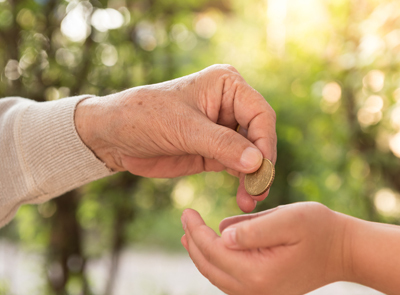 These days, the support is more likely to flow downwards, and grandparents are increasingly likely to provide financial support to their children – and even grandchildren. In other families, time rather than money is being provided. Faced with expensive and often limited formal childcare options, many working families turn to grandparents as a source of low cost childcare. A 2014 report by AMP and the National Centre for Social and Economic Modelling (NATSEM)(ii) found that grandparents provide 23% of all childcare to children aged under 12. Quite naturally, many grandparents relish the opportunity to spend one-on-one time with their grandkids. However, along with the physical demands of caring for a youngster, providing childcare can also be financially taxing, and it’s not just about occasional outings to the zoo or the purchase of a few age appropriate toys. At a time when the pension eligibility age is being raised and pension rates reduced, caring for a grandchild can have a significant impact on a grandparent’s financial wellbeing. A survey by National Seniors Australia(iii) found many grandparents who provide informal childcare are ‘working around care’, and making significant adjustments to their own career as a result. Among those surveyed, 70% altered the days or shifts they worked, 55% reduced their working hours, and 18% had even changed their job because of their caring commitment. On the plus side, the same study found grandparents reported enjoying a far better relationship with both their grandchild and adult child as a result of providing care. But it comes at a cost. Just over one-third (34%) of respondents said their childcare responsibilities had a negative impact on their incomes, household budgets and/or retirement savings. These results highlight the need for seniors to find a balance in how – and how much – they help their adult offspring and grandchildren. We all want the best for our family but as we age we need to think about our own needs too. Increasing longevity means longer retirement periods to plan for, and giving too much today could limit your ability to remain financially independent throughout retirement. Having open and frank discussions with your adult children about the level of support you can realistically provide – both physical and financial – is the starting point in achieving this balance. These may not be easy conversations to have but they are critical to achieve a win-win for all family members. Speak to us about the best way to structure your finances so you can help your adult children while still achieving your retirement goals. ii AMP.NATSEM Income and Wealth Report, Child Care Affordability in Australia, Issue 35 - June 2014.